This is our foldable treadmill. If you have little time to go the gym, go running, or are prevented from running due to bad weather, this is the solution. With this treadmill, your home is your gymnasium that will help you stay in shape. It features a multi-function display so you can track your progress, making it very sturdy, and can be folded manually! 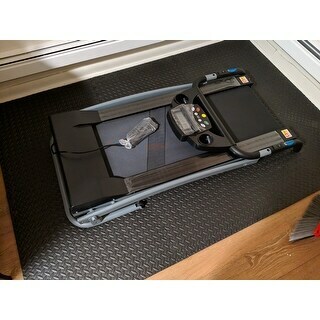 Just received this treadmill yesterday. It was actually smaller than I anticipated but this isn't a problem as it worked out perfectly. I live in a tiny 350sqft cottage and was looking for something that was compact. 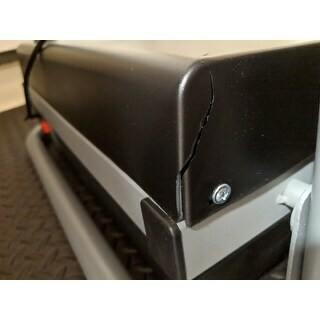 A few notes: #1 I did unbox the treadmill to find the the front was cracked (see photo), it is a small crack and not problematic enough for me to request a return; the product is heavy so I'm not surprised that damaged occurred during shipment. #2 While heavy I was able to finegal this into my home with no help and maximum effort; I'm a 5'2", 24 year old woman with decent upper body strength. #3 The assembly instructions were downright awful and the precut holes in the two pads to secure the handles were not big enough and I had to shave them down to get the screws through. Otherwise set up was easy and took no more than 15 minutes. #4 The cup holders do not fit reusable water bottles but ironically they do accomodate beer bottles just fine. #5 After assembly I tested the machine, it does take a moment for the machine to adjust speed levels so beware. But I found the speed acceptable for what I want it for. I did do a light jog but didn't feel secure enough to keep a steady pace but this may just be because I have a horrible center of gravity and *** knees. Overall, despite my critics, I think the treadmill itself is well built and a great space saver! It folds up easily by removing the bottom screw knob, bringing the back end up and pulling the tension rod and locking it into place. I am happy with my purchase. Received product in less time then anticipated, not too heavy. Put it together before my husband got home. It is small compared to the gym treadmills, which means it takes up very little space. I live in a small home so that is perfect for my needs. The only thing I disliked was the instruction paper and the product manual, it is written in broken english and the drawings are small which makes it difficult to understand. Fortunately the product was not that complicated to figure out, because I assembled it in about 35 minutes. It meets my requirements I can work out when the weather is cold or too hot, and I would recommend it for you as an option if you need it for these reasons. Arrived super quick. Set up easily and works great. I love that I can fold it up if I need to and "hide it away". The tread works great and the ability to change the settings quickly is wonderful. Good display and easy to work. I would highly recommend. This shipped very fast! It is a little small but works great for small spaces. It isnt huge and bulky. Very simple and perfect to just get a quick run in! After reading previous reviews (and of course, after i purchased) the item took longer to get to my house than expected. The packaging stated one weight but online it states a different. Also states that it is a very narrow walk way (and i do not walk straight). This shall be very interesting if the product is as expected, since return shipping is not going to be an option. run smooth and not to loud. It's a little small. could have been a little biger. I do like. my husband get on it every day. This was a great buy for the price. Easy to set up. Works great. It is easy to store out of the way. I would definitely purchase this item again. Very good for the price. 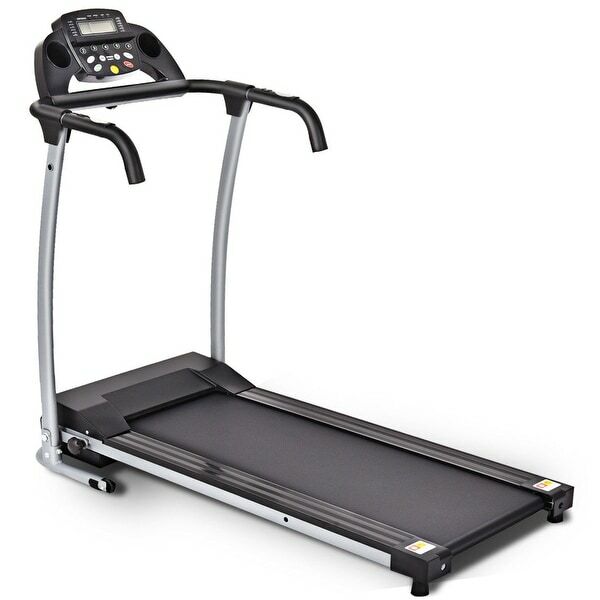 We received the treadmill and the picture is very misleading you cannot walk comfortably the walking area is too narrow nobody walks in a complete straight line I would not purchase this or recommend to anyone, this will be returned. Very upset. The shipping time said will be here by the 3rd. Ordered on the 30th. It’s now the 8th & still no product. Tried tracking it with the tracking number & USPS says it’s not even a valid #. No wonder is so popular. They actually deliver when they say. They are reliable. I will not be buying from here again looks like. Sad & disappointing. No need to lie. Comes basically assembles with just a couple of parts to assemble. Love the way it is easily moved from one location to another and doesn’t take up much room. Only drawback is the tread is narrow than the ones you will find at the gym. It was easy to set up. I like how compact it is, doesn't take up a lot of space. 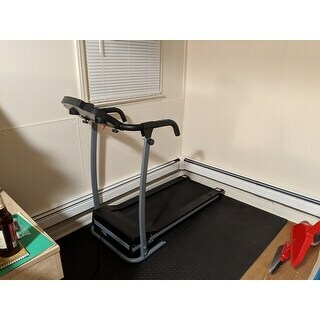 Very simple treadmill, but perfect for my space and needs. I look forward to using it. "how many inclines positions are there?"